AUGUSTA — Down nine points in the third quarter, it was like Dirigo had them right where they wanted them. Trailing St. Dom’s by double digits on Wednesday, the Cougars rallied to topple the top seeded Saints. So when the Cougars were down nine Thursday against Madison, it was no big deal. “That’s the way they play better, when it’s time to step it up,” Dirigo coach Reggie Weston said. The Cougars made their late run once again, and even took the lead with 5:36 remaining in regulation. The seasoned Bulldogs would have none of that, though, and history did not repeat for the Cougars. 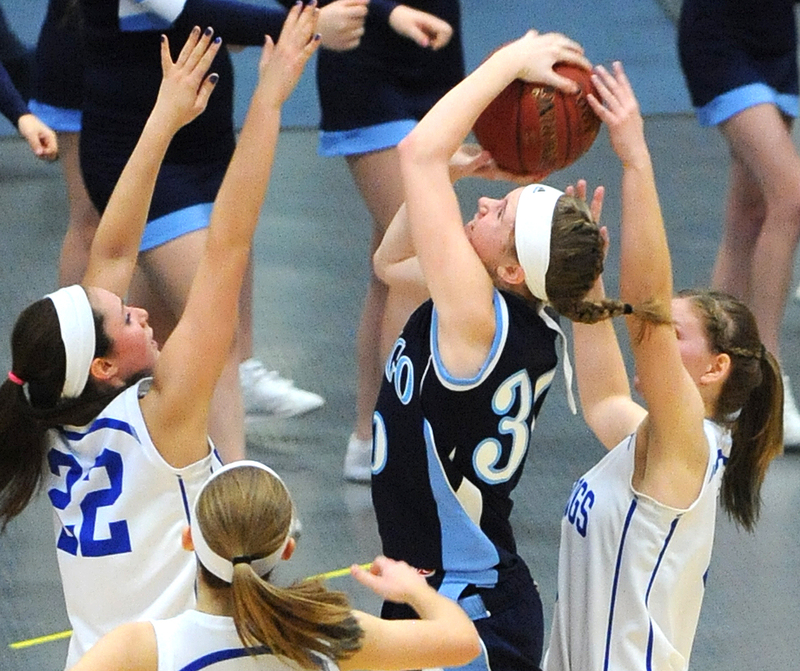 Madison fought off the Dirigo challenge for a 62-58 win in their Western Class C semifinal. The Bulldogs advance to Saturday’s Western C final to play their rivals from Carrabec. It will be the fourth regional final for Madison in the past five years. The Bulldogs have lost the past two. Dirigo (13-8) took the lead at 50-49 with 5:36 to play on a basket by Kelsey Hutchins and two free throws by Jessica Conant, capping an 8-2 run to start the fourth. Madison (14-6) answered with six consecutive points. A pair of baskets by Emily McKenney and one by Jarvais made it 55-50. After Dirigo got two free throws from Kelsey Wilson with 2:54 left, the Bulldogs got a short jumper from Jarvais and a hoop by Cristie Vicneire, making it 59-52. Dirigo pulled within three in the final minute. Hutchins sanks two from the line and then Sabrina Daoud scored on a rebound with 28 seconds left, getting Dirigo within 59-56. Madison iced it with a free throw by Madeline Wood and then two from Kayla Bess. 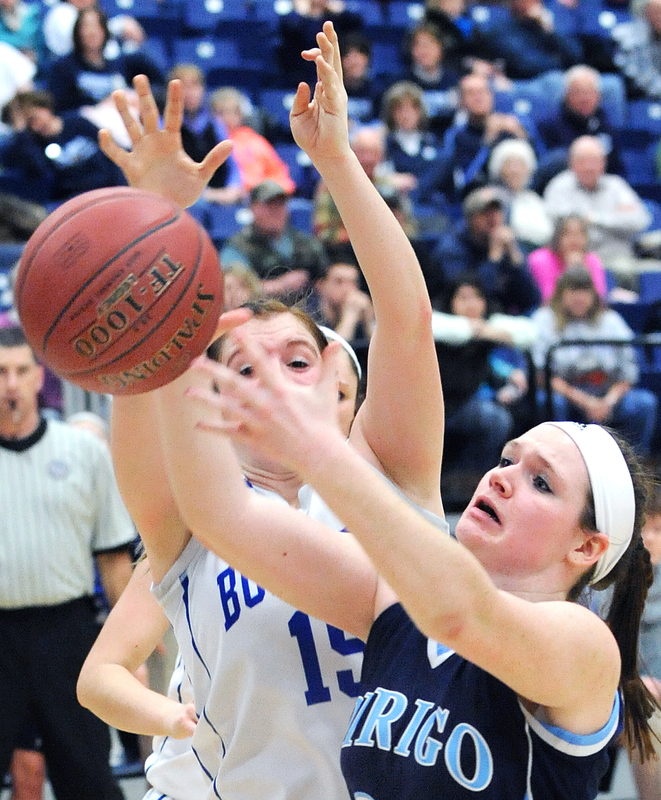 Bess led the Bulldogs with 15 points while Jarvais and Kirsten Wood each had 12. Dirigo was led by Hutchins with 15. Lauren Henderson added 15 while Conant ended with 13. Madison shot just 1-for-6 to start the fourth but finished 6-for-14 from the floor. Madison managed to settle down and start hitting shots down the stretch. 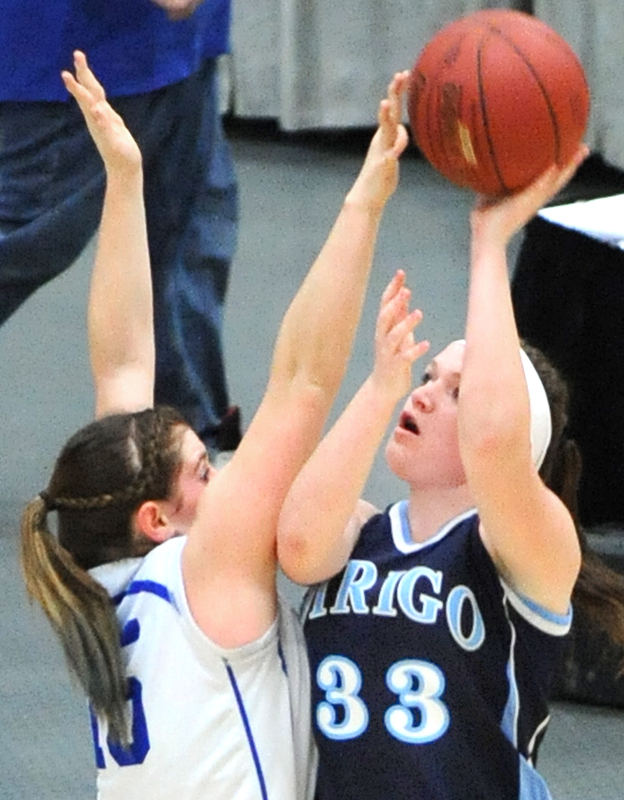 Dirigo’s cause wasn’t helped by the injury to starting guard Emma Lueders. She had injured her hip in the prelim win and aggravated it Wednesday. She gutted it out but had to come out at times down the stretch. Once the Bulldogs started hitting shots, Dirigo struggled to keep pace. Madison opened a 16-12 lead in the first. The Bulldogs dominated the boards, getting 13 offensive rebounds and having a number of second chances on shots. Dirigo tied the game in the second on a 3 from Lyndsy Crutchfield but Madison got baskets by Erin Whalen and Jarvas on a rebound for a 26-22 lead at the half. Dirigo was within one point three times in the third, but Madison opened up a 45-36 lead with an 8-3 run late. Bess had 12 of her points in the third. Dirigo got four free throws by Henderson and a basket by Conant to cut the lead to 47-42 entering the fourth. Though Madison struggled to start the fourth, the Bulldogs didn’t panic.